Well met and good day to you fine folk of Middle-Earth! This is Tomrica Everton, purveyor of tricks and riddles - hobbity burglar of the Stoors. My most excellent and fine friend Danania, graciously invited me to chime in on my misadventures, deeds, oddities, trickerations, and general findings throughout this rather large land that we inhabit. Being that she is the Supergirl of Lorien, how could I turn down such an offer? As she does such a fine job in her own writings, I'll be taking a different path, and hopefully provide you gentle readers with nice bite-sized bits of information for you to take on your journeys. Let us begin! Being a burglar of absolutely no renown, my skills are not as polished as the likes of Danania and the other more powerful warriors in the land. Therefore, my trip to Rohan will be somewhat delayed as I get up to snuff. However, that doesn't mean I can't come well prepared! 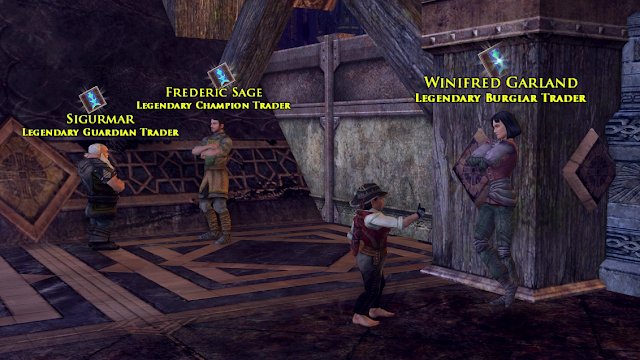 I decided to speak with Winifred, a legendary burglar trader friend of mine, located in the 21st Hall of Moria. She told me she was now able to take rusty dwarf tools, khuzdul tablets, and Bright Emblems of Nimrodel in trade for relics! How nice of her! These relics will work nicely in my Prowler's Purse - and I have so many now! Perhaps I will share some with friends or sell some of them at the auction house? In any regards, much more useful than silly, rusty dwarf tools! I invite you to talk with your class legendary trader and I'm sure they'll do the same for you. I was wondering to myself who is cuter, the sweet demure Tomrica or the gorgeous dream goddess Danania. There are such difficult choices in the world, but it beats thinking about a presidential race. Ginny Weasley? Was she that young hobbit lass up by Lil' Delving, Danania? Probably some fool of a Took, meddling in the affairs of the big folk again. And presidential race - is that some sort of equestrian event? Ah, perhaps a race between those new fighting steeds! That's sounds right... indeed it does, yes, that must be it. Oh and thank ye much for such kind words Harry! You can bet your pie that Tomrica has her own invisibility cloak, though her talents in "magic" cannot even come close to matching those of Danania. Tomrica could have probably assisted you with stunning Fluffy (the three-headed dog guarding the passageway to the Stone), but then again when you dance with Danania, you won't have to worry about squatting on your knees. Tough call, Harry - as long as you don't decide on Lobelia Baggins, either is just peachy with me. Zyngor the Hunter... your exploits across the Riddermark have reached even this hobbit's ears. If I would have know better, I'd be a thinkin' you just made a short joke. A warrior of your stature and renown wouldn't do that to a lass - would ye? I believe he did, Tomrica. Zyngor tried to cut you down to size. And then, he turned and jabbed at Harry, warning him off of Lobelia... I think Zyngor must be sweet on Lobelia and warning others to keep off his woman. You're most welcome Ravanel! 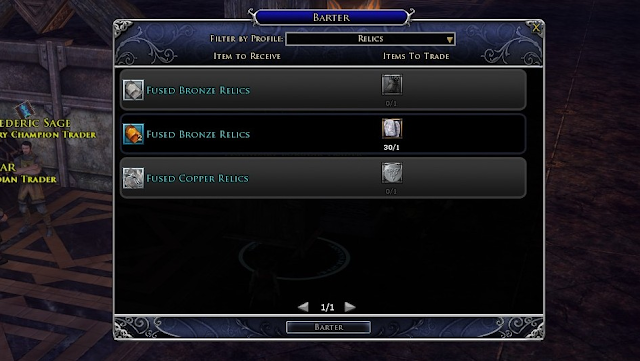 Don't forget to save up your coins, as relic melding can be quite expensive at the upper tiers. Being a purveyor of the odd, I've got so many relics now that I could fill the Mathom House! Plan...foiled. Must...retreat to Bilbo's cellar. Very interesting, Tomrica! I notice that you also tricked SuperDana, as I call her, into posting this for you. Maybe you can trick her into taking me flying one night? Me, a tricksy hobbit?!? Well, ok maybe... a little . But never on friends, and certainly not on Danania! I don't think I've see her give rides to just anyone, but she has eluded to being able to fly on a warsteed... how super is she! Heh, thanks for the advice, but luckily coins aren't the problem. I'm not even selling stuff to the AH regularly, but I just find myself with more and more gold without doing much for it (probably because I don't *spend* it on the AH either)! Thanks for the interesting take! Supergirl, you are a true blessing to this community. No it is not worth the effort to raise items and decontruct them. And thanks for the confirmation. I *knew* there must be a reason why I had 3000 T1 relics, hehehe. ;) Good to see that I wasn't somehow getting magic fused relics.